Cord Binding During Slew - Now PHD calibration fails! I had a power cord bind my CGEM mount during a slew and had to manually release the clutches. Now I get the dreaded star failed to move in RA error during PHD calibration. Any suggestions? Is it possible I need open the mount to ensure the worm and gear are properly seated? Does it slew to and track objects OK? Do the slews sound normal? Check the cords going to your auto-guider. Can you post the PHD Guide log files. EDIT - Is there an increase of RA backlash? Edited by Jim Waters, 21 March 2019 - 10:02 PM. Tracking/slewing works fine, and sound the same as before. Backlash also seems the same. I’ll have to post the guide log tomorrow. Post the logs there and ask for help. One more question. Does the RA Clutch still work? I'm wondering if the events scrambled the controller's mind a bit. I presume you've power cycled the mount / hand controller. Maybe try a complete reset (back to factory settings)? My Nexstar controller got confused one night while aligning it, and after that it refused to come even close to where it should have gone during subsequent alignment attempts. Like, off by a quarter of the sky not close, even after power cycling. A complete reset of the controller fixed the issue. Are you trying to calibrate on an object near the pole by any chance? That's one reason why RA might not move enough. If the handcontrol can nudge the mount, so should PhD2. Power-cycle the mount, start from scratch. Assuming you pulse guide, try calibrating on a star near meridian and equator. Thanks, guys, for the suggestions. I'm using ASCOM for the mount, and attempted to recalibrate near the equator. Everything else seems to be in the original working order, and guiding was even working great for a short time after the binding event. I'll try posting at the link provided by Jim. 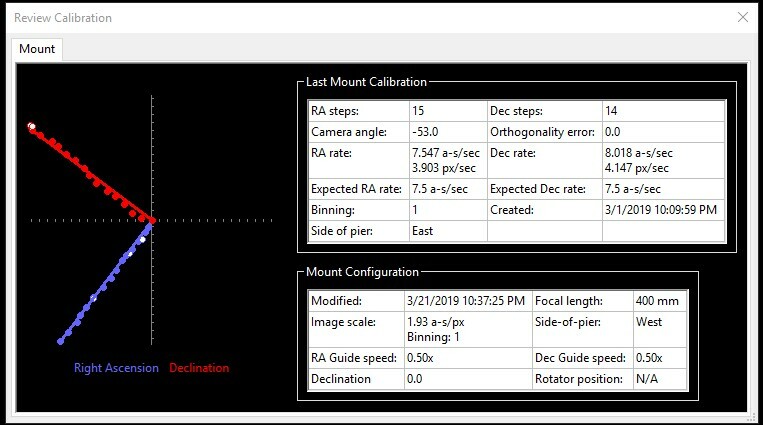 I've also attached the calibration info that was working up until the slew event. Edited by FloridaObserver, 22 March 2019 - 07:36 AM. It’s just me, but I’d check my USB guide cable first. Did you try swapping it out? If you get a reply from the PHD Guide developers get back to us with an update. Bruce Waddington replied with his opinion that it's not related to a damaged cord (given that I attempted recalibrating using ASCOM and the ST4 port). So, my best guess is that some binding in the RA gear occurred, so went ahead and reset the gear with the worm. The proof is when it gets dark in an hour. Will let you know. It's all good now, so it looks like the problem was gear binding. Here is the log after a fresh calibration using ASCOM. About as good as can be expected for an old CGEM.